Doug has added a 4600 watt PV to his passive solar home. The project has a unique mount system, which is durable, has a very clean and simple look, and saves substantial money over commercial mounts. The system uses the Enphase micro inverters which improve efficiency and simplify wiring. The end result is a very high quality system for an amazing $2.29 per peak watt. Thanks again to Doug for taking the time to document the project! Having experimented and lived with solar thermal most of my adult life, building a passive solar home with solar water heating and using solar cooking, I knew the power of sunlight. Since panel prices recently fell considerably, it seemed the time was right for solar electricity. Having done all that was reasonably possible to reduce electrical usage through conservation and efficiency, my wife and I had our usage down to where we could afford the photovoltaics to create about the same amount of electricity we use on an annual basis. In my state, homeowners are allowed to do any electrical work on their own home as long as it gets inspected. This brought me to the decision to do the installation myself of 4.6 kilowatts of grid tied solar. For those who have access to the electrical grid, a grid tied system is the least expensive way to go solar. It is also the most efficient, as batteries used in the other standalone or grid tie with battery backup systems lose 10 to 20 percent of the energy put into them. The batteries also have to be replaced periodically and that can be hazardous and expensive. Grid tied systems are simple with no moving parts and no maintenance required from the homeowner except possibly an occasional panel cleaning. The grid functions as your backup generator and batteries. Here in Tennessee, my electrical provider TVA has a program called Generation Partners http://www.tva.com/greenpowerswitch/partners/ which guarantees all Green energy producers $.12 a KWH over their base rate for the next 10 years, as well as a $1000 incentive upon connection. This is better than many other areas of the country where the utility pays you the same as retail or less. This means I could have installed a system that produced half the power we currently use and still zero out my bill. By putting in a system that would produce as much electricity as we use annually, our payback period will be shorter. Only after the acceptance call came, did I start buying materials. The contract gave me six months to get the system completed and inspected. After much online research, it seemed to me that Enphase micro inverters were the best way to go. These are small inverters that are usually used one to a panel. They have several advantages-they are more efficient than central inverters, they allow for easier future expansion, they come with a great free online monitoring system, maximum power point tracking, and simplified wiring. They also have the ability to tolerate shading or varying roof orientations and tilts, and they can tolerate module mismatch and module soiling, as well as minimizing impact from passing clouds. They put out 240 volts AC, which I was already familiar with, and they simply plug into the panel and connecting cable. An internet search found a company that was offering a short-term sale on 230 watt Canadian solar panels combined with the M215 Enphase micro inverters, so I bought 20 of each. Having had just put on an energy conserving white metal roof, and having my solar hot water collector in the middle of my semi-shaded south facing roof, a ground mount was the logical choice. The best place was about 65 feet on the southwest side of my home. I briefly considering using wood for the rack, the 25-year warranty on panels and inverters and projected life of possibly 50 years made me want to build for long-term. As I can weld, I decided to use inch and a half (2”OD) schedule 40 galvanized steel pipes. I could buy the five lengths of pipe I needed locally for about $55 for a 21-foot length. The website- http://rredc.nrel.gov/solar/calculators/PVWATTS/version1/ makes it easy to determine the best angle for year-round production, which was 30 degrees for my location. The only tool that was not already owned by me and needed for this job was a low-cost pipe notcher, which I found on sale for $24 from- http://www.harborfreight.com/catalogsearch/result?q=pipe+notcher It uses a drill press mounted hole saw to cut the proper angle in the pipe. Using the notcher to cut each 21-foot length of pipe into three sections went well. They were then welded together so there was a leg front and back connected by the 30 degree angled support piece. 1.5 inch galvanized pipe mounts with concrete footings. Verticals are welded to the angled module support beams. My array is arranged in what is called a portrait configuration with the long sides of the panels going up and down, two rows of 10 each. This uses a shorter and less expensive special connection cable for the Enphase micro inverters, creating an array about 11 feet by 32 feet. There was no reason not to allow the array to follow the western slope of the ground. Mounts and rails with PV modules attached. The three point hitch posthole auger on my tractor made it fairly easy to bore 10 holes in the ground about 2 1/2 feet deep. Welding a small horizontal section of steel onto each vertical post halfway down the hole added stability. Once the concrete is poured around this piece, it makes it impossible for the pole to slip up or down, and it increases its footprint. 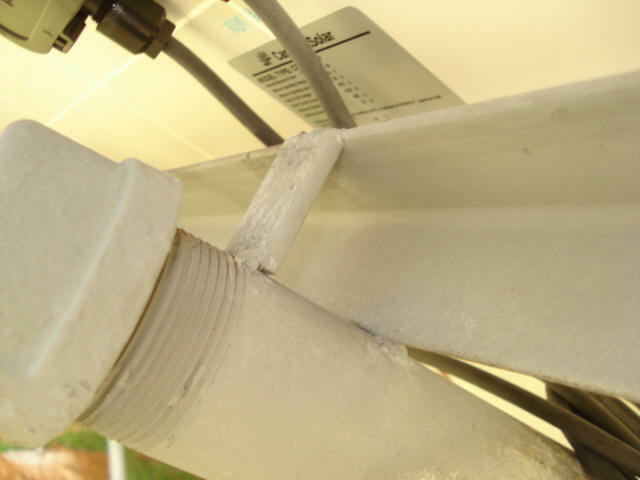 Looking at the aluminum rails that PV panels are commonly mounted to, they seemed rather expensive and difficult to attach to the galvanized pipe. The ones I found online were about six dollars a foot plus shipping. That gets even more expensive because longer lengths need to be truck shipped. Instead, sold locally is inch and a half steel angle iron for a little over a dollar a foot. I picked up seven 20-foot lengths. They were cut and welded to make four 32-foot lengths, and then measured and drilled for the holes that the panels would bolt to before welding them to the uprights. I amazed myself when all the holes lined up! welded to the 1.5 inch pipe mounts. 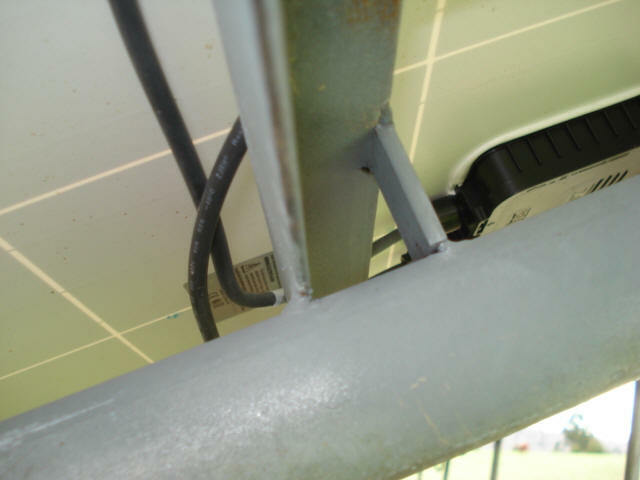 Closer view of the PV module angle iron support rails. 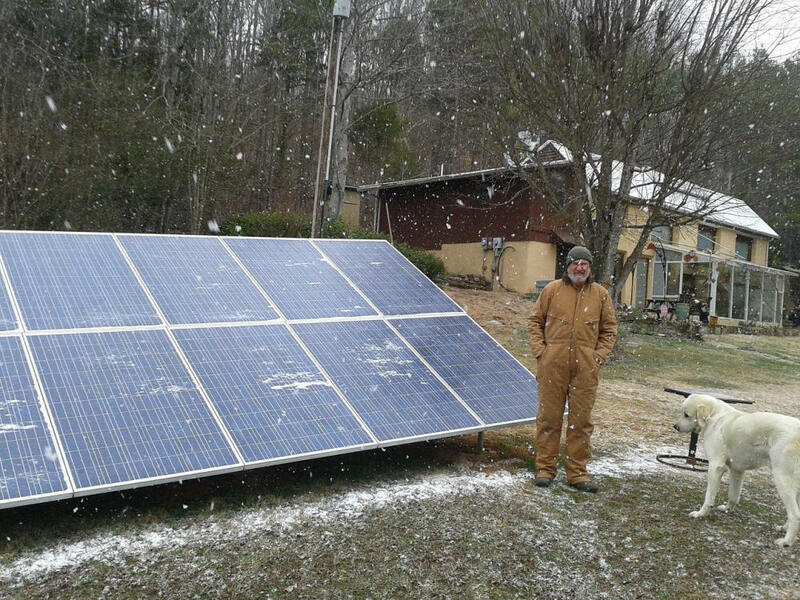 After bolting the panels to the angle iron using stainless steel hardware, I mounted a single inverter behind each panel and simply plugged the panels into the inverters, and the inverters into the two connecting cables, which ran the length of the array. The Enphase inverters cannot have more than 17 in a string. So my system with 20 panels required two Enphase cables having special terminals at each dead-end, while the ends closest to the house went into a small breaker box- a combining load center, in solar speak. Each cable back feeds to a two pole 20-amp breaker. The power then gets combined before entering the conduit to the house. Each panel and inverter got connected in series to each other with a number six solid copper ground wire. One end went to an eight-foot ground rod under the array and the other to the ground in the combiner box. The steel rack and rails are also tied to the ground system. daisy chain cable as this is the last inverter in the row. The load center at the PV array. of inverters gets a pair of 20 amp circuit breakers. the top center is the feed to house. go to the PV array load center. Code requires the top of the conduit to be buried at least 18 inches below grade, and I had tree roots and rocks to deal with so I called in my neighbor with his trencher. The trencher cut through my phone wire to the house as well as the phone wire, power and temperature alarm wires from the house to the greenhouse, and my low-voltage path lighting wiring. I strongly suggest mapping where all your underground wires go, and calling the phone company before you dig. Trenching for the wire from PV array to the house. 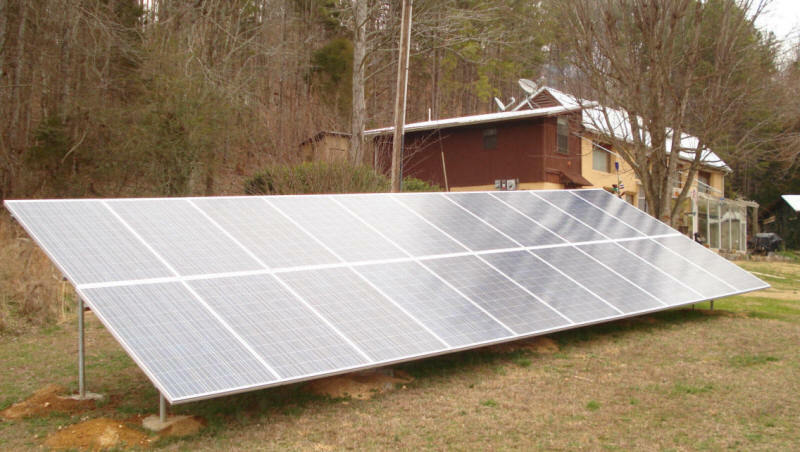 The TVA requires what is referred to as a line or supply side connection, which means that the solar feed connects to the grid at their usage meter. Many parts of the country use what is called a load side connection. This would require running the cables from the solar array into the house breaker panel. Line side was much easier for me. I had to buy a meter base for the solar supply meter, and a manual disconnect switch. The wiring from the array runs through the buried conduit into the solar supply meter; into the manual disconnect switch, and then over to the usage meter. All boxes were connected with grounds and to a ground rod. Closeup of the new meter. After mounting the boxes and pulling the wires through the conduit, then wiring up to the usage meter, my wiring job stopped temporarily as I couldn't get in the sealed meter base until TVA came to cut off the power. First I had to have the electrical inspector come out to do an inspection. All was well and I got the stickers and the go-ahead to connect. The PV array disconnect at the house. This completely disconnects the PV array from the utility power. Inside the PV array disconnect. Two weeks later, I had an appointment to get connected - it was exciting to finally get to the point where my system could start producing solar electricity. TVA sent a technician with a meter to make sure that if the grid power goes off, my solar array will not back feed into the grid possibly endangering a lineman. This is a feature built into all grid tie inverters called anti-islanding. From what I have read, there has never been a case of an approved inverter putting power back into the grid when the grid is down. However, on smaller systems like mine, TVA requires $100,000 of liability insurance coverage, more on bigger systems. When the connection day finally came, it was cold, snowing, windy and completely overcast, yet the system put out enough power to successfully complete the test. With the Enphase Enlighten monitoring system, anyone can go to My Enphase Web Page and see current and historical production. As of this writing, it's only been connected for a month of short and often cloudy winter weather. Even so, it is averaging just a little under our usage. I feel confident the longer sunny days of summer will create more power than we are using. This works out to $2.29 per peak watt. All in all, I'm happy with the choices I made to use top-quality panels and the latest inverter technology. I'm also satisfied with my decision to make a long-lasting galvanized steel rack solidly welded up. I was very fortunate to have an experienced solar installer to consult. I really don't think I could've done it without the advice and support he gave me as well as the specialized solar items he sold me. There is a lot to know as the system must be properly designed and code compliant. Friendly and cooperative utility representatives, broadband Internet access and a good collection of tools to work with also helped to make this possible. Doing this was a worthwhile endeavor for economic reasons as well as environmental ones. Grid tie installations are now the most common solar electric installations in the US, they're the most economical, lowest maintenance and the simplest to install also. I saved money by doing all the labor myself, coming in at about $2.29 a watt. If you cannot do it yourself you can find an installer at- findsolar.com. Either way, I feel the time has come to make more use of this free energy, especially here in the sunny southeast where we use more electricity than any other part of the country, and more of it is coal-fired. So, come on over to the clean, sunny side of electrical production-go solar electric now! Dog is not so sure about this new contraption.